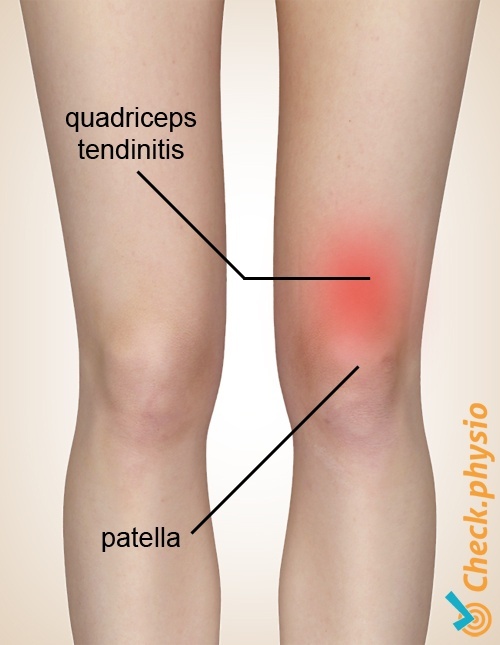 Quadriceps tendinitis involves inflammation of the quadriceps muscle. This causes pain symptoms on the front of the knee, just above the kneecap (patella). 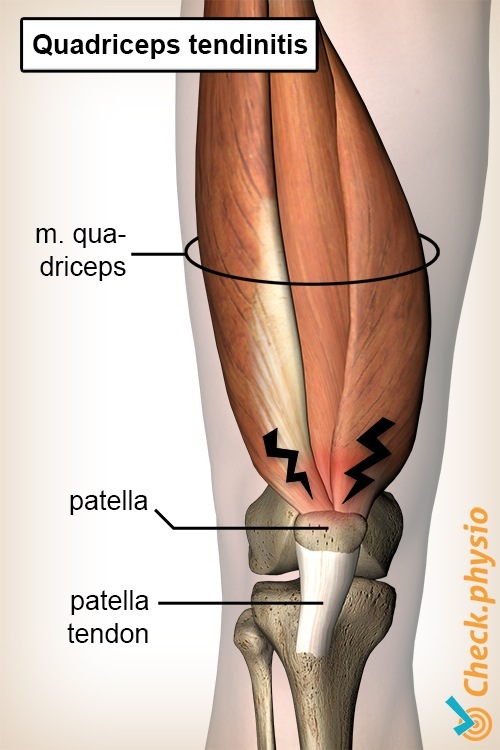 Quadriceps tendinitis is often seen in athletes. The muscle that extends the knee is called the quadriceps muscle. It consists of a group of muscles on the front of the thigh, attaching to the top of the patella via tendon tissue. In the case of quadriceps tendinitis, the tendon tissue is inflamed. An inflammatory reaction occus when small amounts of damage or tears develop in the tendon tissue. Over-exertion through sporting activities is the most common cause of this condition. However, it can also affect people who do not exercise. Pain above the knee, particularly when extending the knee. For example, when running, jumping, crouching or cycling at high resistance (low gear). The symptoms can also occur after exercise. The pain can sometimes be provoked by pressing on the inflamed tendon. Localised warmth and/or swelling can also occur. The physiotherapist can make the diagnosis. The symptoms can be alleviated by relative rest, physiotherapy and anti-inflammatory medication if necessary.